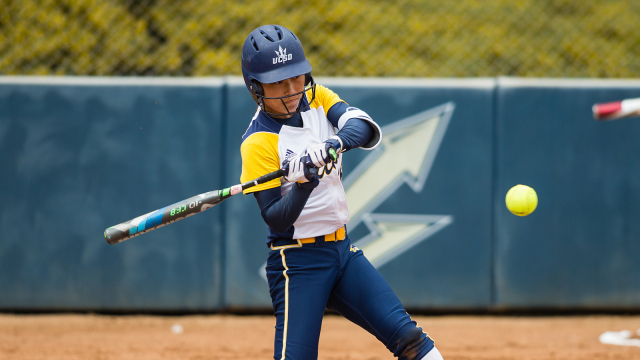 The UC San Diego softball team faced off against California Collegiate Athletic Association rival California State University, East Bay on Friday, April 5 and Saturday, April 6. The Tritons’ four-game series — two games on Friday and two games on Saturday — against the Pioneers was shortened to just two games. UCSD was able to play its first two games at Ohlone College in Fremont, California, but the final two games, scheduled to be played at San Francisco State University, were canceled due to unplayable field conditions. In the first game, UCSD beat CSU East Bay 5–4. The game came down to the final inning. At the top of the sixth, the Tritons scored two runs, pulling ahead 5–3. The Cougars, however, put pressure on the Tritons’ lead, scoring one run at the bottom of the sixth to bring the deficit to just one run. In the seventh inning, the Tritons were able to hold onto their one-run lead. Despite not scoring in the seventh inning, UCSD was able to stifle the Cougars’ attempt at a comeback, limiting them to just one hit in the seventh inning to win the game. The second game of the series did not go as planned, however. In an upset, the Tritons lost to the Cougars 8–3 in their second game. Going into the game, UCSD was the clear favorite, sitting atop conference rankings, while the Cougars were near the bottom: The Tritons had a record of 26–6 while CSU East Bay was sitting at 10–25. UCSD was unable to get anything going while at bat. For three out of the seven innings, the Tritons were set down in order without recording a hit. Despite the loss, the Tritons were able to put together some solid individual performances. Freshman left-fielder Keila Bosinger led the team on offense, recording a team-high 3 hits. On defense, junior Brittney Ross-Smith had a nice outing at first-base with 9 putouts. Next week, the Tritons take on Azusa Pacific University in a midweek doubleheader. This is the first time UCSD will see Azusa Pacific this season. They were set to play each other in late February, but that series was postponed. The series will begin on Wednesday, April 10 at UCSD.